Fleuroselect, the international organisation for the ornamental plants industry, is delighted to announce that Karol Pawlak has taken on the role of President from 1st January 2019. Left Karol Pawlak, right Marc Driessen. Karol Pawlak is the founder of Vitroflora, a Polish young plant producer of starting material for pot and bedding plants. The company is a specialist in the growing business of perennial young plant production from seeds, cuttings and tissue culture. Vitroflora is a well-respected partner of the main leading horticultural companies in the world. "In times of globalisation and constant change, Karol is the perfect man to take Fleuroselect to the next level. He has been on the Board of Directors for the past six years and knows the internal structure very well. Karol's entrepreneurial mindset, horticultural expertise and personal network will be a tremendous asset for the Organisation", states Jean-François Ignasse, Sales Manager Europe for PanAmerican Seed and resigning President ad interim. 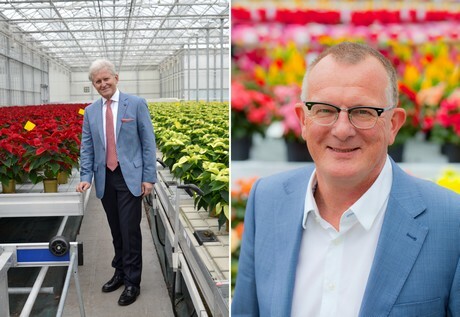 Marc Driessen, Director of Beekenkamp Plants Ornamentals, has been appointed Vice-President by the Board of Directors. "I am delighted that Marc has agreed to be on my side during my Presidency. His international expertise and commercial insights will be key in our strategy for the next years. Together, we will take the reins of the Organisation and ensure a steady future for the membership", says Karol Pawlak.